In an industry as heavily regulated as rail, the concept of risk, operative health and rail safety needs to be rigorously managed. Historically, this has been done via processes underpinned by paper and printing, which in the digital age, becomes inefficient and difficult to track, maintain and manage long-term. Since the launch of the smartphone in 2007, the way in which we communicate, collaborate, live and work has been completely transformed. Consumer predilection has fuelled the industry transition to adopt digitally-led processes and has seen Software as a Service (SaaS) forming vital elements of the digital roadmaps across entire industries on a global level – the rail industry has not been exempted from this shift. Rail’s approach to safety is now being digitised, with processes and procedures being managed and distributed via smartphones and smartphone apps. The use of smartphones across the railways was once prohibited on site, due to fear of risk or injury to a potentially distracted workforce. However, in the past decade, this attitude has been turned on its head, with the future of the railways and the future of rail safety becoming more driven by – and aligned with – the current state of work across other industries. 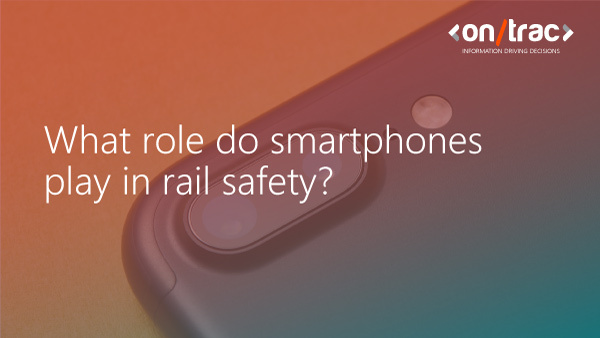 The realisation that arming disparate workforces with smartphones would dramatically improve the efficiency and quality of work being carried out – as well as transforming operative safety – came quickly to the rail industry. Providing staff with the digital tool to overcome the mounting challenges that paper-based processes were raising, led to a further realisation that would could be implemented more safely, while simultaneously reducing operational costs – as well as increasing productivity across the railways. OnTrac’s own product suite was developed with the widespread industrial permeation of the smartphone in mind, and by collaborating directly with our customer base, we have been able to continually adapt our product suite to ensure the benefits of an automated approach to rail safety far outweigh the outdated alternatives. By showcasing how data could be harnessed, analysed, cleansed and utilised to enhance rail safety, while reducing the variable element of human behaviour, the benefits of digitising rail safety became clear. Since adopting the RailHub platform, customers across train operating companies, freight operating companies and the supply chain understand the importance of digitising processes to unblur the lines between the realities and perceptions of rail safety. Arming staff with smartphones and apps loaded with the digital tools needed to plan and deliver work on or near the line, has seen our products become a trusted means of planning works delivery across the rail industry, and awarded with a Safety Integrity Level 4 (SIL-4) last year. Equally, our partners in app development, Nutshell Apps, are also providing rail customers with digital solutions to industry woes, to secure the future of rail safety. With apps such as, Close Call apps, the company’s customers can respond to close calls instantly, on site, providing standard industry information (date, time, potential severity of situation, location etc.) that can be transmitted instantly. What’s more, their fatigue management apps are supporting the rail industry’s workforce on their mission to solve the challenge of fatigue. Nutshell are highlighting, not only how accessible and easy to attain an enterprise mobility strategy is, but also giving the rail industry’s workforce a digital, drag and drop app building platform, to allow them to solve these challenges themselves, without needing the technical knowledge usually required of app developers. The benefits of smartphones and apps to automate rail safety are becoming increasingly wide-reaching. Enhancing the industry’s culture of safety by transforming how rail handles its risk assessments and information is becoming increasingly important, as the rail industry moves towards its Digital Railway goals. As such, the implementation of smartphones in rail has marked a defining moment in the industry’s digital transformation.